As you cross over the Boca Grande Causeway, you’ll begin to notice that time seems to move at a slower pace. The world you’re used to, the one filled with fax machines, voice mail and fast food… it all disappears. What you’ll find once you cross the three small bridges leading to Boca Grande, is a seven-mile island which retrains the “Old Florida” lifestyle that fosters relaxation and an environment of tranquility. 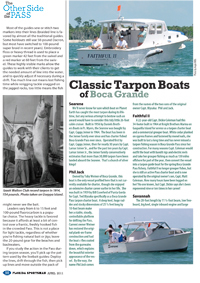 Boca Grande is world-renown for its concentration of tarpon and excellent fishing opportunities; but there is so much more to the island. Pristine white-sand beaches and cool, clear teal waters await boaters as well as sunbathers and shell hunters. Open-air restaurants and gourmet cuisine meets every visitors’ need and taste. A multitude of galleries feature local artists who capture the feel of the island in oils, pastels, & watercolors. And there are numerous gift shops which pique the curiosity with their unique gifts from around the world. There are also numerous recreational activities for adults and children alike: bikes, kayaks, paddleboards, rollerblades, and golf carts are just some of the rentals available by the day or by the hour. And the Community Center features public tennis and basketball courts for those looking for more competitive activities. Just north of Boca Grande, and about 30 miles south of Sarasota, lies the small fishing town of Englewood, Florida. Originally settled by citrus farmers, the coastal town retains a great deal of its small town charm, but has grown a bit over the years to become a quaint resort destination. Englewood has a small historic downtown district on Dearborn Street which has half a dozen restaurants, several antique dealers, an art gallery, and some fun gift shops. The Olde Englewood Village Association often holds car shows, art fairs, and community festivals on and around the Dearborn Street area. It’s quite a lively place during the fall and winter seasons. Englewood is also chock full of waterside tiki bars and restaurants! A favorite of locals, these open air venues are a great place to enjoy live music, have some fresh gulf shrimp, and maybe even a libation or two! To get the full “Florida Experience,” GCCB recommends Lock-N-Key restaurant and Gulf View Grill on Englewood Beach and Royal Palm Marina/Zeke’s off of Old Englewood Road. Stump Pass Tiki Bar, Flounders, and White Elephant are also fun venues for a drink and live entertainment! Englewood has some of the best access to water in the area. The town has multiple public boat ramps, fishing piers, and kayak launches. If you want on the water, it’s no problem to get there! Stump Pass is the primary access to the Gulf from Lemon Bay, and the fishing around that area is fantastic due to the many, many mangrove islands. Don Pedro Island is a state park with incredible beaches only accessible by watercraft, and has a small lagoon of sorts that is another hot spot for fish. There is also a system of creeks in the area that provide lots of places to kayak and paddle board (Oyster Creek, Rocky Creek, Ainger Creek). Add to all this three public beaches on the mainland, and you have yourself a true waterfront community! Though Englewood has only a few motel options, there are many rental options on the beach in area condos. Most accommodation rentals require a 2-3 night minimum. Contact GCCB for a list of referrals.